A big Trust Matters welcome to Ago Cluytens, whose guest blogpost follows. Ago is not only a sales expert, but also a past buyer of B2B and consultative services–he has worked both sides of the sales street. Ago is also Practice Director EMEA for RainGroup, a highly respected sales training, consulting and research organization. Ago’s comments are based in part on an interview he and I recently conducted; a link to the interview itself is embedded in the blogpost. If you are reading this blog, there is little doubt that you’re bought into the idea that trust is a cornerstone foundation of doing business today. You probably already know how to build trust with prospects, clients, colleagues and peers. How to position yourself as a trusted advisor. 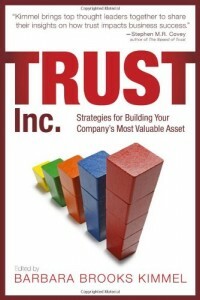 You understand the basic dynamics of how trust is acquired, expanded and sustained over time. And you probably have a good idea of how, and why, trust is lost. Trouble is, what you think you know may be wrong. In a recent Hangout with Charlie, we covered five surprisingly common myths about trust. Five axioms that are universally accepted, almost without question. Five so-called truths that sound logical and reasonable – but are, unfortunately, plain wrong. There are those who believe that trust takes a long time to build. They talk about it being a journey, often one of many weeks and months, before trust is there. And once it is earned, it can be lost in the blink of an eye (see next myth). The truth is, we often rely on a small set of indicators to decide whether we trust someone or not – almost instantaneously. We look at their professional credentials. Their network and the people they associate with. The firm they represent. Their educational background and experience. And based on those factors, especially in business, we make a decision to trust someone very quickly. It doesn’t take that long – in fact, if it did, almost no business would be done in the world today. Another stubborn myth is that trust is hard to gain, but easy to lose. In our conversation, Charlie raised an important point – once we trust someone, really trust them, it’s often very hard to stop trusting them. Think about it like this: imagine you’ve had a positive, enriching and mutually rewarding working relationship with someone for many years. For whatever reason, something goes wrong. Would you stop trusting them instantly? Or would you give them “the benefit of the doubt”, see how they handled the situation and then decide whether or not to continue trusting them in the future ? My guess is it would be the latter – relax. Once trust is gained, it’s not all that easy to lose. As a former corporate manager and executive, I’ve been in many situations where I’ve had to make an important buying decision based on relatively little input. Often, no more than some online research and a couple of meetings with potential vendors. Yet, I (and others like me) have made decisions to allocate significant budgets, resources and corporate investments based on a single question: do I trust this person? In truth, when you are selling something non-tangible like professional, financial or technology services, putting trust in the bank is very much like putting cash in the bank – a very wise investment with tangible, measurable benefits and returns. We often look to others to earn our trust – as if it is something that is exclusively ours to decide whether we give it or not. The fact is, we often have to give trust first in order to receive it later. There is something extraordinary about how our own actions impact the behaviors and actions of others. When we decide to trust someone, we very subtly invite them to do the same – and often with the desired effect. Trust and risk are often used in the same sentence, as if they are two sides of the same coin. Where there is some truth to that (often, trust is lost when a risk gone wrong is handled poorly), there’s more to it than meets the eye. The notion of risk is part and parcel of doing business, and trust is not merely a risk reduction mechanism. In many cases, trust is built or enhanced through risk. We start trusting someone more once we’ve seen how to handle a tricky situation. We decide to trust them based on how they have overcome an obstacle or particular challenge in the past (also called “references” or “case studies”). Trust is not solely about reducing risk – it’s about a complex interplay between both when they interact, grow and – when things go very wrong – destroy each other. In this post have taken a deeper look at five surprisingly common myths about trust. But I’ve also left out one important truth: the most important factor in building trust is you. You are what makes others decide to trust you. Your behavior. Your actions. Your mistakes and how you handle them. Meaning that, in the end, whether or not you become a trusted advisor is very much down to you.